Teen Health is Glencoe's middle school health series, designed for students in grades 6-8. The 3-book program serves the need of those schools where health is taught in more than one grade level. The program's strength in the classroom has always been the self-contained, 4-6 page lessons. This structure provides flexibility, allowing the teacher to tailor the course to their specific teaching methods and to the school or district's health education framework. Teen Health features a 1-column format for ease in readability, and includes visual elements such as graphs, charts, tables, and infographics. Lesson and chapter features are attractively designed and easy to distinguish from content. Each side-column feature has its own unique design. Building Health Skills combines positive role-modeling of featured skills with practicing those skills and evaluating the performance. Hands-On Health features are science-based experiences requiring little or no scientific equipment to illustrate various health concepts. Character Education helps students understand, care about, and act on core ethical values. 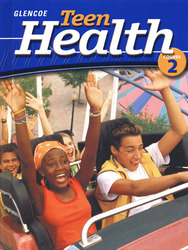 Teen Health promotes reading and writing skills. Quick Write features are at the beginning of each chapter and lesson. Reading Checks are found throughout each lesson, promoting better comprehension and retention of content while providing an opportunity to improve reading skills. Media Watch raises students’ awareness about the media’s impact on their lives and health. Connect to… provides cross-curriculum activities to help students see how health is related to other curriculum areas such as science, mathematics, languages arts, and social studies. Glossary/Glosario defines each vocabulary term in English and then separately in the Spanish Glosario. Hands-on, experiential lessons involve students in activities and the use of problem-posing and problem-solving skills applied to real-life situations. Varied activities appeal to all learners, regardless of learning style, including hands-on activities, simulations, role-playing, group work, long-term projects, consumer and community projects. Technology-based options give teachers multiple ways to tailor the curriculum to the needs of individual students and classes, and engage students’ interest by providing exciting opportunities to explore health-related issues. Home and community learning activities promote good health for all, and effectively link home and school. Teen Health promotes health literacy by addressing the knowledge and skills that promote positive health behaviors. The materials and activities found in Teen Health are based upon the National Health Education Standards, as well as the evaluation strategies delineated in Assessing Health Literacy: Assessment Framework (1998, Council of Chief State School Officers).